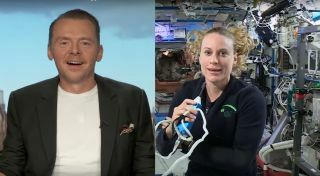 "Star Trek Beyond" actor and screenwriter Simon Pegg talked with astronaut Kate Rubins while she was on the International Space Station. In a conversation with "Star Trek" actor and screenwriter Simon Pegg, space station astronaut Kate Rubins said she feels like she's living in the future — and that the iconic science fiction franchise is fairly accurate in representing life in orbit. Paramount Movies uploaded the full, 25-minute video to YouTube this week as part of the company's promotion for the movie "Star Trek Beyond," which is available now on Digital HD and will be released on Ultra HD 4K and Blu-ray on Nov. 1. "That is incredible. I can't think of a more conducive environment to watch a science fiction movie than from space," said Pegg when he heard the story. Pegg plays chief engineer Montgomery Scott (aka Scotty) in the film, for which he also co-wrote the screenplay. While Pegg said he is used to playing a fake astronaut (he has appeared in two other "Star Trek" movies), he expressed fascination with some of Rubins' daily activities on the space station. Rubins said she felt some disorientation during her first few weeks in space, trying to stay in an "up" position even though there is no up or down in a weightless environment. Lately, however, she said she has the opposite problem. Ground control asked her to take pictures of exercise equipment with the top of the equipment in an "up" position. She admitted, "I couldn't get it right." "It must be like sea legs times a thousand," quipped Pegg. This year is the 50th anniversary of the "Star Trek" franchise, and Pegg paid tribute to some of the ways the series has inspired real-life technology. He thought of the example of flip phones, he said, because they resemble the "tricorder" communicators used in "Star Trek: The Original Series." Rubins later added that she wished she had a tricorder on station to look at medical data (the fictional devices had many of the same functions as modern smartphones). Another feature of the "Star Trek" universe is artificial gravity, which is a reality today — sort of. There are experiments on the station that can create artificial gravity using a centrifuge, which is a container that spins around very quickly, pushing its occupants against the outside edge. Some science fiction movies have portrayed centrifuge space stations. Rubins said that just before speaking with Pegg, she was doing a microbiology centrifuge experiment with a drill that replicates artificial gravity on a small scale. She pointed out that to make it a reality for humans, the centrifuge would need to be much, much larger. Pegg then asked Rubins if she does any special tricks in microgravity. "Sometimes, I try to do them on camera for PAO [public affairs office] events," she said. A favorite activity of hers is pulling a bubble of water out of a drink bag and moving it along her hand, although she joked it looks like a horror movie once the bubble envelops her hand. In the crew's spare time, Rubins has used microgravity for entertainment purposes. A recent weekend saw her and several other astronauts playing a new game on the walls and the ceilings of the ISS; she described it as a cross between football and Quidditch, the famous game from the "Harry Potter" fantasy franchise in which players fly around on broomsticks. Rubins also described her recent spacewalk outside the station, when she and her colleagues worked to prepare the orbiting complex for the arrival of new commercial crew vehicles in the coming years. She said her biggest problem was not fear — that's trained out of astronauts, she said — but containing her impatience to get outside immediately. "I had to almost hold on inside because I was so excited to get out that hatch," she said. "It was just an incredible experience." Rubins said she particularly enjoyed the view of Earth in the spacesuit; she also spends a lot of time looking at the Earth through the station windows. Station crew members take a lot of photos of the Earth, she said, adding that she experienced some disorientation while taking pictures because "your normal scale doesn't catch up" when looking at the planet. Michigan and the city of Vancouver are visible in one view, or all of Europe. "It takes a while to get used to that." Rubins and two of her Expedition 49 crewmates (Russian astronaut Anatoly Ivanishin and Japanese astronaut Takuya Onishi) are expected to land in Kazakhstan at 11:59 p.m. EST (3:59 a.m. UTC) on Saturday (Oct. 30). You can follow coverage of the landing at Space.com.